WEST HARTFORD — For about four events in the middle of the Wednesday’s CIAC Class S boys swimming championship, it was apparent two epic teams were going back and forth chasing the same dream. It was Borg-McEnroe of the 1970s. Or, perhaps, the Lakers-Celtics of ’80s. Truth be told, it was 21st century version of Brookfield vs. Holy Cross swimming and it proved to be a classic. After trading the lead after each event, Brookfield scored 103 points over the final two individual events of the meet, securing its second straight Class S championship over Holy Cross, 630-575. Haddam-Killingworth was third with 455 points. 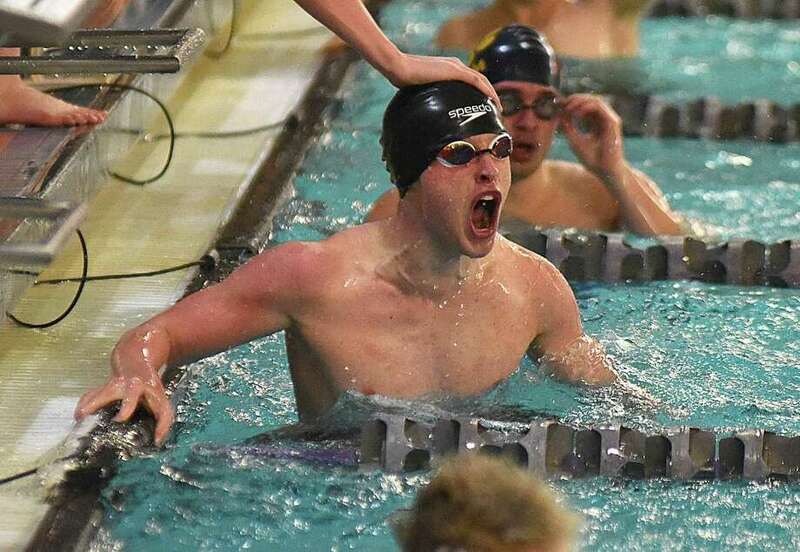 While Holy Cross swept all three relays and won three individual events, Brookfield went deep into the well, finding points in all three flights to claim the championship. Following the 100 freestyle—when Holy Cross took third, sixth and seventh—the Crusaders led 364-358. After the 500 free, though, Brookfield led 427-397 by getting points from four different swimmers — Tim Osika (4th, 4:54.31), Nathanial Kaalman (10th, 5:08.53), Kevin Tang (11th, 5:11.72), and Henry McKenny (16th, 5:22.33). Holy Cross’s win in the 200 free relay cut the gap to 16 points before Liam Connors swam a momentum-changing 100 back for Brookfield, placing third in 54.86, breaking the 55 second barrier for the first time in his career. It was an emotional boost for the team, Reiff said. The momentum carried over over into the 100 breaststroke, where Leonardo Tamer (4th, 1:01.91) and Becker (5th, 1:02.37) both scored in the A-flight, and Nicholas Castilho was 16th (1:08.12). That gave Brookfield an insurmountable 65-point lead on the Crusaders. Brookfield also got strong swims from Tamer in the 200 IM (4th, 2:00.74), Thomas Foster in the 50 free (22.06), and Osika in the 200 free (5th, 1:48.53) in the A-fight in addition to countless points out of the B and C finals. Additionally, earlier in the week, divers Justin Corress (425.4) and Tobin Henderson (311.85) were second and fifth, respectively. Team scores: 1. Brookfield 630, 2. Holy Cross 575, 3. Haddam-Killingworth 455, 4. Sheehan 382.5, 5. Northwestern 370, 6. Sacred Heart 236, 7. Seymour 231, 8. Watertown 204, 9. Shepaug Valley 202, 10. Granby Memorial 189, 11. Lewis Mills 172, 12. Rocky Hill 167, 13. Woodland 149.5, 14. Litchfield 144, 15. Gilbert 125, 16. Northwest Catholic 122, 17. East Catholic 116, 18. Plainville 94, 19. Nonnewaug 87, 20. Classical Magnet/University 80, 21. Old Saybrook 65, 22. (tie) Immaculate and Oxford 56, 24. Westbrook 49, 25. Wamogo 40, 26. Rockville 36, 27. (tie) Goodwin Tech and Bolton 35, 29. Ansonia 33, 30. North Branford 31, 31. Valley Regional 19, 32. SMSA 15, 33. ND-Fairfield 7. 200 medley relay: 1. Holy Cross 1:39.32; 2. Haddam-Killingworth 1:41.41; 3. Sheehan 1:44.76; 4. Brookfield 1:45.70; 5. Lewis Mills 1:49.14; 6. Shepaug Valley 1:49.78; 200 freestyle: 1. Daniel Walsh (Sacred Heart) 1:45.62; 2. Zach Houlton (Haddam-Killingworth) 1:46.72; 3. John Tucker (Holy Cross) 1:47.32; 4. Derek Fantano (Northwestern) 1:48.20; 5. Timothy Osika (Brookfield) 1:48.53; 6. Zachary Fell (Seymour) 1:50.25; 200 IM: 1. Lucas Racevicius (Holy Cross) 1:57.02; 2. Chris Fryer (Holy Cross) 1:59.78; 3. Shayne Simmons (Immaculate) 1:59.86; 4. Leonardo Tamer (Brookfield) 2:00.74; 5. Garrett Smith (Westbrook) 2:03.37; 6. Colton Labrecque (Rockville) 2:08.81; 50 freestyle: 1. Sam Mason (Holy Cross) 21.71; 2. Jack Crocamo (Seymour) 21.76; 3. Aleksej Cupic (Seymour) 22.00; 4. Thomas Foster (Brookfield) 22.06; 5. Alex Beauchene (Northwestern) 22.07; 6. Jack Pesce (Shepaug Valley) 22.59; 100 butterfly: 1. John Tucker (Holy Cross) 52.26; 2. Thomas Foster (Brookfield) 52.29; 3. Christopher Weber (Granby Memorial) 53.27; 4. Garrett Smith (Westbrook) 54.34; 5. Elijah Houlton (Haddam-Killingworth) 54.83; 6. Liam Connors (Brookfield) 55.40; 100 freestyle: 1. Jack Crocamo (Seymour) 47.75; 2. Alex Beauchene (Northwestern) 48.06; 3. Sam Mason (Holy Cross) 48.20; 4. Kyle Mazziotti (Haddam-Killingworth) 48.25; 5. Joey Zellner (Sheehan) 49.15; 6. Alex Ford (Holy Cross) 49.47; 500 freestyle: 1. Derek Fantano (Northwestern) 4:46.97; 2. Zach Houlton (Haddam-Killingworth) 4:47.34; 3. Daniel Walsh (Sacred Heart) 4:48.79; 4. Timothy Osika (Brookfield) 4:54.31; 5. Chris Ford (Holy Cross) 5:01.64; 6. Zachary Fell (Seymour) 5:01.80; 200 freestyle relay: 1. Holy Cross 1:31.99; 2. Haddam-Killingworth 1:33.33; 3. Sheehan 1:33.40; 4. Northwestern 1:34.45; 5. Sacred Heart 1:34.56; 6. Brookfield 1:35.33; 100 backstroke: 1. Christopher Weber (Granby Memorial) 52.56; 2. Lucas Racevicius (Holy Cross) 52.58; 3. Liam Connors (Brookfield) 54.86; 4. Kyle Mazziotti (Haddam-Killingworth) 55.51; 5. Jake Torello (Haddam-Killingworth) 56.78; 6. Jack Pesce (Shepaug Valley) 56.79; 100 breaststroke: 1. Shayne Simmons (Immaculate) 1:00.48; 2. ALeksej Cupic (Seymour) 1:00.85; 3. Joey Zellner (Sheehan) 1:01.86; 4. Leonardo Tamer (Brookfield) 1:01.91; 5. Alec Becker (Brookfield) 1:02.37; 6. Ben Bowler (Holy Cross) 1:02.84; 400 freestyle relay: 1. Holy Cross 3:14.05; 2. Seymour 3:18.39; 3. Haddam-Killingworth 3:19.27; 4. Brookfield 3:27.53; 5. Northwestern 3:29.32; 6. Sacred Heart 3:29.57.